Pomona officers at the scene of a standoff with a stabbing suspect in Pomona, Calif., on Tuesday, May 31, 2016. 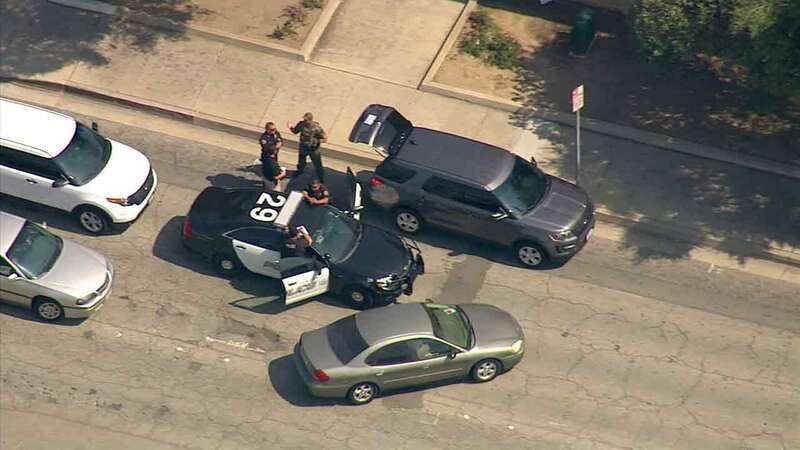 POMONA, Calif. (KABC) -- Pomona police SWAT officers were in a standoff with a female stabbing suspect before she surrendered in Pomona Tuesday afternoon. Officers responded to a stabbing call in the 200 block of W. Arrow Highway around 1 p.m. and found a male stabbing victim suffering from a serious wound. He was transported to a nearby hospital in critical condition. Police said the suspect was contained inside a building, possibly armed, and was on the phone with police negotiators. Authorities at one point said she was threatening suicide. After the brief standoff, the suspect surrendered to SWAT officers without further incident, Pomona police said. Information during the investigation revealed the incident appeared to be a domestic dispute. Arrow highway between Garey Avenue and La Verne Avenue were temporarily closed during the incident, and residents were asked to avoid the area.